Posted in: Meetings. 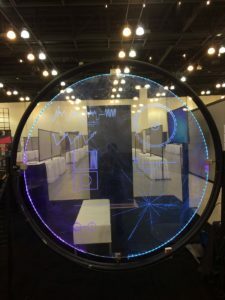 Tagged: dpsepsc, exoplanets, planetary science. A plexiglass replica of Voyager’s golden record by Steve Vance and others. The first day of the DPS meeting was wall-to-wall with science. There were several talks about exoplanets or planets outside of our solar system, and at least one stuck out especially to me. Christopher Spaulding of Caltech discussed the so-called “Kepler Dichotomy“. This cryptic phrase refers to a strange finding from the Kepler Mission. Kepler discovers planets using the transit technique (i.e., by looking for a planet’s shadow as the planet passes in front of its star), and so we expect only to find a small fraction of planets in our galaxy this way since it’s unlikely for a planet’s orbit to be aligned just right for a transit. In fact, Kepler found lots of systems in which several planets transit. By looking at these systems, we can estimate how many systems should have just one planet that we can see transiting. When we do, it turns out that Kepler discovered lots more such single planets that we would expect. This result has led some astronomers to suggest that these singly-transiting systems might have formed in a different (“dichotomous”) way from the multi-transiting systems. Instead, Spaulding suggested that culprit behind this planetary mystery was the host star. In his talk, Spaulding pointed out that, during their youths, these stars spun fast enough that they bulged out at their equators. These equatorial bulges tugged gravitationally on their planets, causing the orbits of planets closest to the stars to re-align and leaving the orbits of planets farther away alone. The closest planets just happen to transit, but, because the orbits of their sibling planets are aligned differently, we just can’t see them via transit. Like a lot of exoplanet research, Spaulding’s work shows that planetary systems, especially in their youth, can be dynamic, even violent, places for planets to grow up in, far from the clockwork universe Newton envisioned. Quilling moon by Jen Grier (@grierja). In addition to science talks, the DPS meeting has begun hosting an astronomy art show. 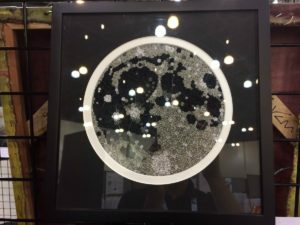 The same folks who collect planetary spectra and analyze photometric light curves also make some beautiful art, and one of the neatest works on display was a quilling (rolled paper art) image of the lunar surface.